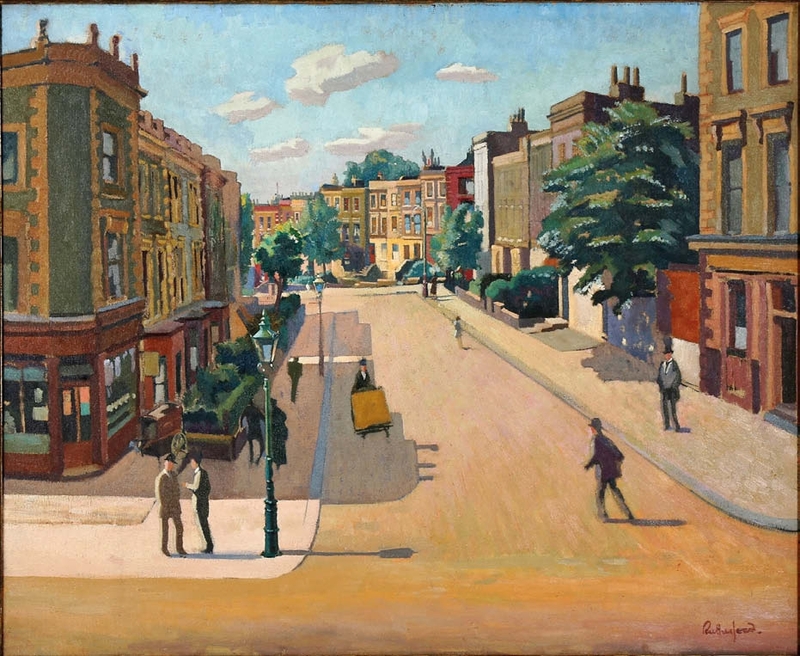 A London street view by the northern English artist Harry Rutherford (1903-85) led the sale at Chiswick Auctions (22% buyer’s premium) on June 13. Camden Town, 1933 by Harry Rutherford, which sold for £13,500 at Chiswick Auctions. Camden Town, 1933 had been in the same private home since 1977, and belonged to a group of works the artist painted while in the capital under the tutelage of his mentor and friend Walter Sickert (1860-1942). Today, few works from this period appear at auction, mainly due to a bomb hitting Rutherford’s studio in the Second World War and obliterating a considerable amount of his work. Research done before the sale by David Hayes of the Camden History Society revealed that the ‘Camden Town’ view was actually a street in nearby Kentish Town. To be exact, a view from the uppermost section of Torriano Avenue, westward from Brecknock Road. His research also found that Rutherford had rented a studio just opposite Torriano Avenue (the same building where Sickert had acquired a studio from 1909-15), and is likely to have painted this elevated view from the studio window. The 23in x 2ft 5in (60 x 75cm) oil on canvas also included an incomplete study of a fairground to the verso, thought to relate to a series of works Rutherford undertook at Gorleston on Sea near Great Yarmouth in 1932. Hayes’ research, coupled with its scarcity and market freshness, all helped push the canvas well beyond its £2000-3000 guide to sell at £13,500 to a private collector. That anonymous collector lives a mile away from the street scene featured and was particularly attracted by the quality of the work as well as the local connection. He told ATG: “Rutherford is a key member of the underrated Northern School and, in my view, this is one of his best works. It’s a particularly important painting in his oeuvre given how much of his pre-war work was lost to the bomb damage.